If you are you planning to attend the 2017 NBAA Schedulers and Dispatchers Conference in Ft. Worth, Texas on February 7–10, please stop by Booth 1313 and say hello to Luxivair SBD…Southern California’s premier FBO. Take a Tour of Our Premier Luxivair SBD FBO Facility! Luxivair SBD is your FBO of choice in Southern California. Our goal is to provide you with superlative service the moment you arrive by catering to any airside or landside need. For all passenger and crew requirements, your comfort is our focus. Luxivair SBD is excited to announce that we will be participating with Epic Fuels (Booth 3700) at the NBAA Business Aviation Convention and Exhibition 2016…November 1–3, 2016, at the Orange County Convention Center in Orlando, Florida. 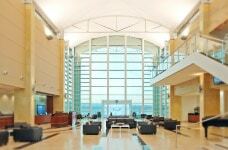 Luxivair SBD, the sophisticated FBO at San Bernardino International Airport, welcomes pilots, crews and passengers. Once you have landed on our 10,000-foot runway, we will cater to your every need. You have easy access to the greater Los Angeles area without the hassle of dealing with congested airspace and city traffic.